ECHO PARK — It’s not finished yet. 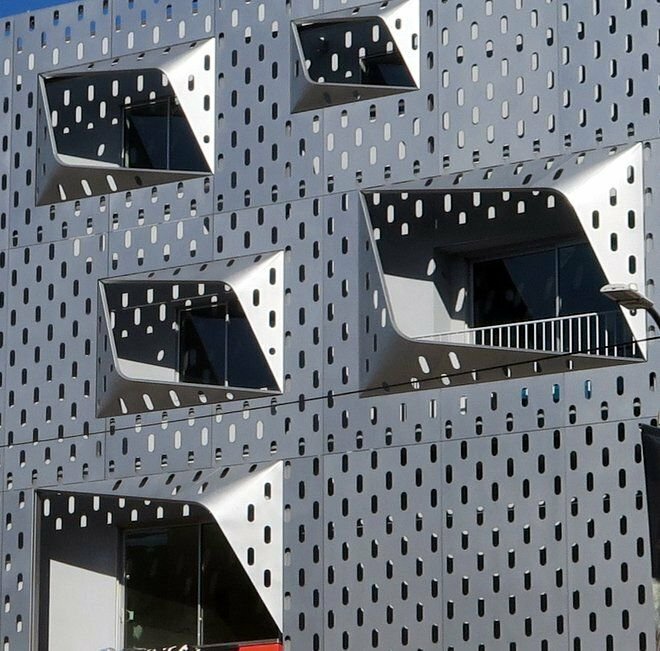 But the new four-story apartment building that resembles a giant cheese grater on Sunset Boulevard is shaping up to be one of the neighborhood’s most eye-catching pieces of architecture. There’s plenty to look at from the street. Patches of dark orange and chartreuse are painted across walls of bright white stucco. Unpainted vertical strips of wood mask the sides of the 27-unit building. But it’s the perforated metal screen up front — made from precision-cut panels of aluminium — that’s the big attention getter. The screen was complex enough that architect Warren Techentin was compelled to create a large, 3-dimensional model in addition to computer-generated drawings to spot potential problems. The approximately 101-foot-wide screen serves as a decorative element but also shields the building against the sun on the south and west sides of the building. After being fabricated off site by the firm Arktura, the pieces of the screen were lifted into place and installed on a support system that juts out from the stucco walls. Much of the screen resembles a shiny computer punch card with rows of vertical noches. 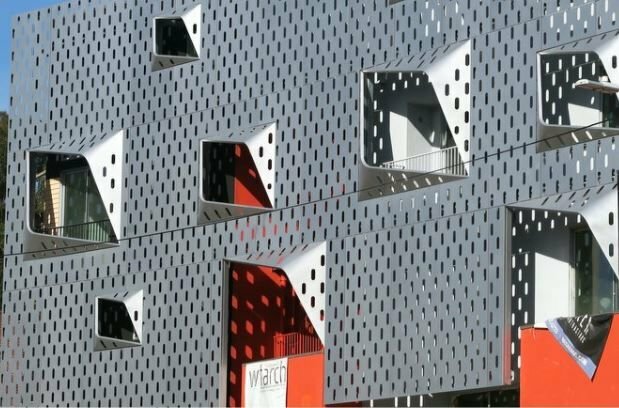 However, the screen also includes larger openings, referred to as “eyelids,” that wrap around balconies and larger windows. The Eastsider has contacted Techentin’s firm to get more details about the screen and completion date. Whatever your opinion about the building, it’s now part of the Echo Park landscape. Can’t get enough Echo Park news? Sign up for The Eastsider’s Echo Park Weekly email newsletter. Echo Park Weekly features EP-centric stories, tidbits, advice, observations, information as well as the week’s top news.